Robert R. Brubaker, 89, of Littlestown, Pennsylvania, died on Wednesday, October 17, 2018 at the UPMC Pinnacle Hanover Hospital in Hanover, PA.
Born on June 13, 1929 in Brunswick, MD, he was the son of the late Cyrus B. and Emily F. (Reed) Brubaker. He was the husband of 70 years to Elsie Lee (Dix) Brubaker. Robert worked for the Johns Hopkins Applied Physics Lab (Space Division) in Howard County, Maryland for many years, retiring in 1993. 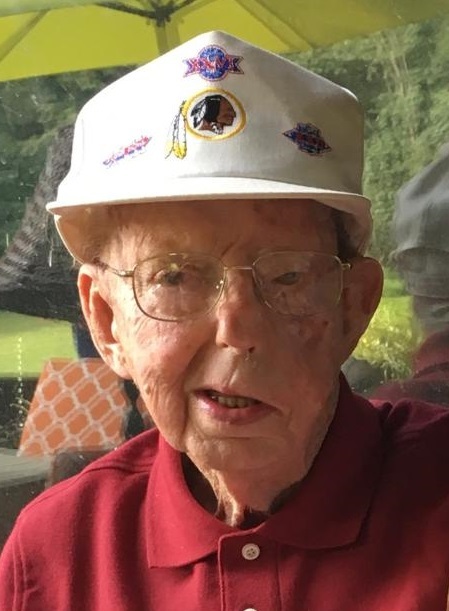 He was an avid Washington Redskins fan and enjoyed photography. Surviving in addition to his wife are daughters, Joan Lee McNealy of Parkton, MD, Joyce Ann Tracy of Dover, PA, and Janet Louise Kearney and husband William of Murrells Inlet, S.C.; granddaughter, Jennifer Lynn Tracy; great-grandson, Jacoby Robert Clark; sisters, Barbara Phillips of Bulls Gap, TN and Peggy Tomlin of Westminster. He was predeceased by a brother, Charles Brubaker, and son-in-law, Christopher McNealy. Funeral Services will be held at 11:00 a.m. on Saturday, October 20, 2018 at the MYERS-DURBORAW FUNERAL HOME, 91 Willis St., Westminster, with funeral celebrant John C. Morrill officiating. Entombment will follow in Evergreen Memorial Gardens in Finksburg. The family will receive friends on Friday, October 19th from 2-4 and 6-8 p.m. and on Saturday from 10 a.m. until the time of service at the funeral home. Memorial contributions may be made to the Alzheimer’s Association, 1850 York Rd, Suite D, Timonium, MD 21093 (alzfdn.org).